Willi Langkeit was wounded in the fighting that took place in that area around Schaulen. He was hospitalized and sent to the homeland to convalesce, where he was placed in charge of the division’s replacement brigade in Cottbus. But he was not there for long. By the end of January 1945, he was again leading armored forces, this time an element composed of forces from the replacement brigade, as well as cadre from the armor school in Wünsdorf. The Kampfgruppe was dispatched to the Eastern Front, where it reported to General der Infanterie Busse’s 9. Armee, which was facing the Soviets approaching the Oder. At the time of Langkeit’s arrival, the Soviets were rapidly advancing with two large armored forces in the Oder-Warthe Bend, the main effort directed at Frankfurt an der Oder and Küstrin. Immediately after his arrival, Langkeit received orders to move through Frankfurt towards Reppen and bring the Soviet forces there to a standstill. It was imperative that the high ground east of the Oder, which dominated the entire region, remained in German hands. The failure of the Soviet effort in that sector was primarily thanks to the noteworthy bravery of Oberst Langkeit, who personally got involved with complete disregard for himself and, as a result, helped rally the forces that had been hastily assembled and had not yet developed any cohesiveness. I personally witnessed his exemplary actions. On 20 April, the Armed Forces High Command approved the recommendation, especially since Langkeit had also been taking all of the forces pouring into his sector to form a new division-Panzergrenadier-Division “Kurmark”-which he was also earmarked to command. Indeed, he seemed the perfect choice for the upcoming struggle that was to decide the fate of Germany. Generalmajor Langkeit experienced the final weeks of the war with his ad hoc division, first fighting his way out of encirclement west of the Oder and then taking it to Beelitz to the rear of General der Panzertruppen Wenck’s 12. Armee. During the last days of April, he received the third level of the Tank Assault Badge for having participated in 75 or more armored engagements. On 7 May 1945, the young general went into captivity with his division, surrendering to U. S. forces. Following the war, Langkeit entered the Bundesgrenzschutz-Federal Border Protection Service-in 1951. He helped form the coastal protective services of that agency and led them for a long time as a Brigadegeneral. Willy Langkeit passed away in Bad Bramstedt on 27 October 1969. It was not on the Western Front alone that the armies of the Third Reich suffered military defeats in the autumn and winter of 1944. An Allied advance in Italy, slow but maintained, drove the German defenders from below Cassino, northwards and almost to the plain of Lombardy, while in Greece Loehr’s Army Group began its long overdue withdrawal. Every theatre of operations had witnessed disasters but it was on the Eastern Front that Hitler’s hosts suffered their severest defeats in that autumn of reverses. By the end of 1944, the vast expanse of Soviet territory which the Wehrmacht had conquered during 1941 and 1942, had been retaken by the Red Army until only a thin buffer, the western half of Poland, separated the spearhead forces of the Red Army from Germany’s eastern provinces. The Soviet summer offensive of 1944, Operation “Bagration”, had smashed Army Group Centre (soon to be renamed Army Group “A”) and had brought the Russian forces to the province of East Prussia which STAVKA was now preparing to take out in a major offensive. The once powerful Army Group North, by this time reduced to just a handful of divisions in Courland, had been forced back until it had the sea behind it and the Russians to its front and on both flanks. Colonel-General Guderian, Chief of the General Staff at OKH, demanded that Hitler use the 30 experienced divisions in Courland to break through the Russian encirclement and to link up with other German formations in East Prussia where they, and the forces in East Prussia, would threaten the northern flank of any Soviet advance towards Berlin. Hitler rejected Guderian’s demand with the result that by December 1944, the encircling Red Army was so strong that an attempt at a link-up between the German forces in Courland and those in East Prussia had absolutely no chance of success. Guderian then proposed that Army Group North be evacuated by sea from Courland and moved to bolster the last remaining German-held sectors of western Poland. That suggestion, too, was turned down by the Fuehrer. General Gehlen, head of the General Staff Department (Foreign Armies East) and a recognised expert on the Soviet Union, produced figures which showed that the Red Army’s Supreme STAVKA had planned for its nine military fronts to launch attacks between the Carpathian mountains and the Baltic Sea. The first blow would be undertaken by the 2nd and 3rd Byelo-Russian Fronts against East Prussia. The second blow would be launched from a start line in the bend of the Vistula by Zhukov’s 1st Byelo-Russian and Koniev’s 1st Ukrainian Fronts. STAVKA’s strategy on that sector, was to isolate and destroy Army Group A (formerly Army Group Centre) and to advance as far as the River Oder, a distance of some 300km. The STAVKA effort would employ 2.25 million soldiers on just Zhukov’s and Koniev’s Fronts. Between them they would control 163 infantry divisions, 32,143 guns and 6,500 AFVs. On the narrow but vital Baranov sector of the Vistula bend where the main attack was to be made, the Soviets enjoyed a superiority over the Germans of 9:1 in infantry, 6:1 in armour and 10:1 in guns. The Order of Battle of Army Group A was 9th and 17th Infantry Armies and 4th Panzer Army, controlling a force of 30 infantry, four Panzer and two motorised divisions. Strong though that Army Group seemed to be, most of its divisions were burned out and they were, in any case, too few in number for the battle which lay ahead. In an effort to increase front-line strengths, Guderian ordered a thorough comb-out of rear echelon units and this, together with a regrouping and a thinning-out of formations produced 14 divisions. These he formed into a strategic reserve for he proposed, when the current Russian offensive eventually lost its momentum, as it must do after the mighty advances of the previous autumn, to launch a counter-offensive. That riposte would not be able to match the Red Army’s effort in size and weight, but the Chief of Staff was confident that it would gain Germany a valuable breathing space. Guderian was not able to deploy and use that strategic reserve as he wished. Hitler who had planned the offensive on the Western Front, which has become known as the Battle of the Bulge, promptly ordered that Eastern reserve to be sent westwards, assuring his Chief of Staff that its divisions would be returned as soon as it was clear that the Battle of the Bulge was being won. Hitler also comandeered all the construction and road building battalions which Guderian had assembled, together with the heavy artillery he had brought together to support the sectors of the battle line which in his opinion were most under threat. With the removal of so many of the formations essential to its defences the Eastern Front, already under strength, was so dangerously weakened that it would be certain to shatter when the new, major, Russian assault was launched. Gehlen then reported that the Soviets had concentrated in their 90km-wide bridghead at Baranov, in Poland, five infantry armies and six armoured corps as well as a number of independent infantry and armoured formations. The imbalance of forces had now risen in favour of the Red Army to 11:1 in infantry, 7:1 in AFVs and 20:1 in artillery. The Russian superiority in artillery was so high that the local commanders could mass 250 guns on each kilometre of front. Back in the Ardennes it had become clear by the end of December that Hitler’s gamble had failed and that the German forces, which had advanced in the first days of the Battle of the Bulge, were now withdrawing in disorder. Guderian demanded the return of his Panzer divisions to enable Army Group A to meet the imminent Russian offensive. Hitler refused and instead reduced Guderian’s forces still further by despatching Panzer Corps Gille, Guderian’s sole reserve in the bend of the River Vistula, southwards into Hungary where he planned to open a new offensive. The Chief of Staff sent Hitler a final piece of intelligence: “The new Russian winter offensive will open on 12 January”. Still the Supreme Commander refused to reinforce the Eastern Front. Then in the early hours of that day a barrage opened on the Baranov sector which lasted from 01.30 to 06.00hrs. When it ceased a deep silence endured for 30mins after which the bombardment began again. Behind the barrage as it marched across the cratered landscape, special Red Army detachments, punishment units put in as a human sacrifice, advanced to kill those German soldiers who had survived the shellfire. Behind the so-called “Strafbats”, an armada of tanks rolled forward followed by divisions of conventional Red Army infantry. That huge assault broke through the front of 4th Panzer Army and crushed all but the most minimal resistance in the front line sectors. Here and there a German machine gun went into action against the flood of Soviet soldiers marching across the open plains. But it was only machine guns which retaliated. Not one piece of German artillery had survived to fire back at the oncoming Russians. 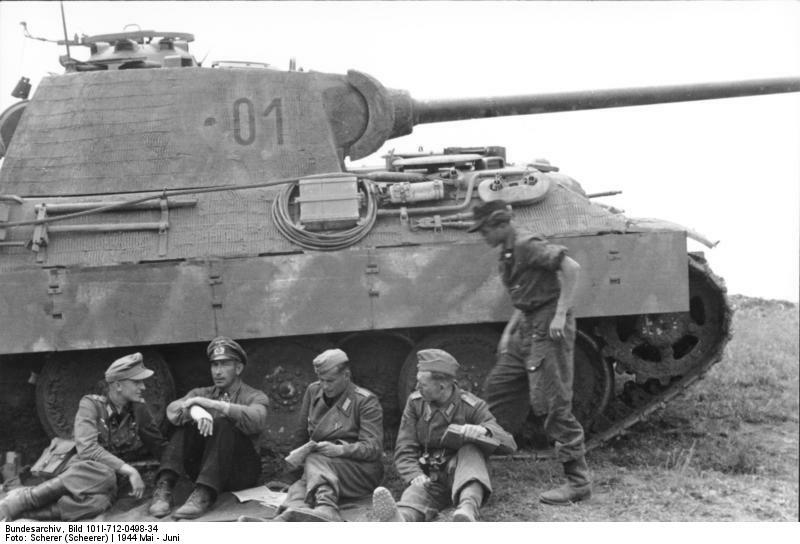 However, the rear units of 4th Panzer Army were not affected by the Russian attack and were able to retreat westwards. Realising, at long last, the need to take action on the Vistula sector Hitler ordered the elite “Grossdeutschland” Panzer Corps, together with a few divisions from Hungary and the Western Front, to restore the situation in 4th Panzer Army’s area. It was a movement undertaken by too few forces and too late in time. Zhukov’s armies were advancing along a thrust line which aimed directly at Frankfurt-am-Oder and were moving with such speed that the probability existed they would reach the east bank of the river before the slower-moving German units and would destroy them before those units could cross to the safety of the west bank. Supreme STAVKA had planned the battle of Berlin as the final operation of the war in Europe and, to prepare the ground for that advance, Zhukov ordered his armies to race for the Oder and to establish bridgheads on the river’s western bank — springboards out of which the Red Army would make the advance to the Reich’s capital. The race to the Oder can be said to have begun when, in the second week of January 1945, Zhukov’s armies stormed across the Vistula. Within a matter of days there was no longer a solid German battle line in that area. On 20 January, Colonel-General Schoerner, the new commander of Army Group A, committed 11th and 24th Panzer Corps to a counterattack to knit up the ruptured front of 4th Panzer Army. It was an effort too weak to achieve any sort of success. The Red Army counter-attacked 24th Corps and cut it off. It then became a “wandering pocket” trying to fight its way back to the German lines. “Grossdeutschland” was ordered to rescue 24th Corps and its assault made such good ground that by 22 January the advance guards from both formations had gained touch. The Eastern Front was collapsing and, faced with that catastrophe, the only solution which suggested itself to the Reich’s leadership was that the creation of a few large and flexible battle groups would have greater offensive/defensive potential than several smaller battle groups. The latter had always lacked heavy weapons and had also experienced difficulties in the matter of supplies and replacements. In accord with that solution High Command directed “Grossdeutschland”, resting after its rescue mission, to create a strong all-arms battle group. Kampfgruppe Langkeit was created on 26 January 1945 and its chief infantry constituent, Corps Panzer Grenadier Replacement Brigade, was a unit unusual for that time since it was at almost full establishment. The other component of Langkeit’s KG was Major Petereit’s Alarm Group Schmeltzer, which also had sufficient soldiers to flesh-out the new, elite and very specialist battle group. To counter the Russian race to the Oder, the German military commanders, lacking sufficient men or weapons, had only the advantages of familiarity with the terrain and an awareness that their officers and men were determined to defend their native soil. It was believed that a system of field fortifications had been set up to the east of the Oder, resting upon a chain of lakes, the so-called Tirschtiegel positions. A water barrier, such as a lake system, has the advantage that it compels an attacker to advance across areas of ground — land bridges — which the defenders can hold in strength. In the case of the Tirschtiegel positions this was not the case. There had been almost no work undertaken and responsibility for constructing the trench lines had been left to Nazi Party political officers who had deserted their posts and fled as the Reds approached. Such positions as had been constructed were rudimentary — a few trench lines, dug-outs and in some places an anti-tank ditch. All showed evidence of hasty and unplanned work. A second line of trenches and dug-outs was in a worse state than the first line, with only the most basic work begun but not completed. The military commanders withdrawing into the Tirschtiegel positions were thus faced with the dual problems that they must not only somehow find sufficient labour to complete the trench systems, but must also man those positions before the Soviet offensive reached them. The only military units immediately available were local militia and Volkssturm detachments, made up of poorly armed men who would be no match for Zhukov’s veterans. In an effort to fill the defence lines with troops the High Command raised units out of any available bodies of men. In some cases officers were appointed to take up Staff positions in formations which had been given grandiose titles but which had no troops. To begin with it was a nightmare scenario but slowly the efficiency and pragmatism of the German military system manifested itself and order was produced out of chaos. The newly-created Kampfgruppe Langkeit was one of the formations which should have manned the Tirschtiegel positions. Its infantry component was renamed Kluever’s Panzer Grenadier Regiment, with Schmeltzer’s Alarm detachment, three Grenadier companies and a machine gun company forming its 1st Battalion. The men, although chiefly young recruits, had veteran instructors, officers and NCOs. Schoettler’s 2nd Battalion had three Grenadier companies, a machine gun and a mortar company. Few of that battalion’s rank and file were “Grossdeutschland” soldiers. No 7 Company, for example, was made up of men from other units who had been taken off trains passing through Cottbus, and taken onto the strength of the “Grossdeutschland” unit. The battle group’s artillery component had been, to begin with, just two heavy field howitzers. Then a battery of light field howitzers was formed and, finally, a light Flak battery with four 2cm guns, four twin-2cm guns and four 3.7cm motorised anti-aircraft pieces, came onto strength. A small SP gun detachment was also created. To obtain AFVs, Langkeit was not so much pragmatic as piratical. He comandeered machines from the factories in which they had been made and requisitioned other vehicles from the “Grossdeutschland” training depots. Many of these latter were powered by charcoal gas engines, others had no turrets and some had no guns — in short, the only factor which made them AFVs was the plating they carried. Nevertheless, Hudel, commanding the Panzer detachment, had soon created an HQ squadron, a Panzer company, a recce platoon, two tank destruction troops each armed with Panzerschreck rocket launchers, and two more troops armed with Panzerfausts. There was also an anti-tank company and a motor cycle company. During the night of 26-27 January the Kampfgruppe, in no way completely raised or forming a homogeneous group, began to move towards the front. The divisional history records that despite the obvious shortcomings and deficiencies in equipment, the morale of the men marching out to give unequal battle was first-class. They were determined to win, even though they knew the enemy was vastly superior to them in number and equipment. Langkeit was ordered to concentrate his Kampfgruppe around Reppen and then to strike north-eastwards into the flank of the Red Army forces advancing upon Stettin. Following on from that operation the KG was next to take up its allotted positions in the Tierschtiegel defences. A few days later the entire battle group set out for Reppen, to undertake its first mission, to attack the flank of the Red Army advancing towards Stettin. On its approach march it was surprised and attacked by strong Russian forces. The principal reason for the surprise encounter was that Langkeit had been given no information on the location of the Soviet forces. His battle group fought back and restored the situation and was then advised that Bittrich’s SS Corps was encircled somewhere near Sternberg. On 30 January, Langkeit sent a battle group, the 2nd Battalion of his Panzer Grenadier regiment, to break through the Soviet encirclement and to bring out Bittrich’s trapped formations. The battalion reached Pinnow and formed two small motorised battle groups to carry out the rescue operation. The Grenadiers were heartened as they carried out their attack to hear the sounds of small arms and artillery fire, believing these to be made by the SS. About midday the true explanation of those battle noises came when Soviet tanks appeared from the north-east and began firing into Pinnow. Patrols then reported to Langkeit that Russian armour and infantry, outflanking the Kampfgruppe to the north, were making for Reppen. Langkeit decided that his priority was to bring out the SS Corps and ordered 2nd Battalion to continue with its attack. By last light on 30 January, the Panzergrenadiers had smashed the Red ring and gained touch with the SS. Not long after that an independent tank-destroyer company of armoured vehicles also broke the encirclement, was immediately taken onto the strength of Bittrich’s group and went into action. Covered by a rearguard formed by 2nd Battalion, the remnant of SS Corps, escorted by the tank-destroyer company, then pulled back towards Frankfurt. Langkeit’s 2nd Battalion then prepared to defend Reppen. Meanwhile, the situation in which the main body of the Kampfgruppe was placed had deteriorated with the report that Russian forces had now outflanked it both to the north and the south. There could now be no question of an advance to Sternberg and 1st Panzergrenadier Battalion, backed by 88mm guns and other artillery weapons, moved towards Reppen to reinforce the 2nd Battalion. It had a nightmare journey. The Reppen road was blocked by columns of slow moving refugees who panicked when JS tanks appeared on the crest of the ridge north of the road and opened fire upon them. North of the road where there was good going, the Red Army commander concentrated the mass of his tanks. To the south of the road where thick woodland made the terrain unsuitable for armoured operations, he put in his infantry. At a point well behind Langkeit’s Kampfgruppe, Russian tank columns cut the road so that the battle group which had been put into action to smash one encirclement was now itself in danger of being surrounded and cut off. It was also dangerously split up. The 2nd Panzergrenadier Battalion was in Reppen, 1st Battalion was on the road to that place and the heavy vehicles and tanks of the main body were isolated from both those battalions. Langkeit formed that main body into two columns and intended to lead them in a mass charge to break the Soviet ring. Such an attack did not and, indeed, could not, succeed because the columns could not deploy off the road and into open country. Trapped fast among the civilian carts they were the principal targets of Soviet infantry and tank gun-fire from north and south of the road — fire that smashed down into the press of carts and people and created enormous casualties. Here and there a few Panzers forced their way out of the press of civilian carts and charged the enemy road blocks but died in the concentrated fire of the Soviet tank guns. Back in Reppen the Panzergrenadiers of 2nd Battalion, squatting in their slit trenches, patiently endured strafing from the air and barrages from mortars and from tank guns. The houses in the town were soon in ruins. The Red commander, thinking that the German troops were now either dead or demoralised, ordered tanks and infantry to mop up the remnants. His decision gave the Panzergrenadiers the chance at last to exact revenge for the punishment they had suffered. A wave of 10 T34s was shot to pieces by the 88s and a Red Army infantry battalion which came in against No 6 Company was wiped out almost to a man. But it was clear the battalion’s ability to resist was nearly at an end and Langkeit ordered it to destroy its vehicles and fight a way through to the main body. During the night of 31 January, covered by a barrage, the heavy weapons were destroyed and the Grenadiers and artillerymen marched to join the main body. The situation in which the KG was placed was desperate and Langkeit decided to make a break-out attempt through the woods south of the road. Once his units had grouped in the forest they would be faced with a difficult, tiring march but the Russian infantry in the woods were less strongly armed than the tank units on the main road. It should, therefore, be easier for the Kampfgruppe to fight its way through and escape. The battle group’s last surviving eight-wheeled armoured car went into the forest to reconnoitre the route and, although the first reports were encouraging, the situation deteriorated again during 1 February. The units filtering along forest rides and secondary roads, once again became closely entangled with civilian columns and came under fire from Soviet infantry forces which had now entered the woods in strength. Langkeit’s light Flak groups, heavy machine guns and Pak poured fire along the edge of the forest to beat back the Red Army units and to aid the slow-paced withdrawal. Stuka aircraft of Colonel Rudel’s tank-busting squadron were brought in to aid the escape but their efforts had little success. Langkeit’s “O” Group during the night of 2 February, heard a bleak report. The guns were down to two rounds each and the break-out through the woods had not succeeded. He proposed that the Kampfgruppe make a swift, direct thrust along the road. This might succeed so long as it was covered by a strong rearguard. Spearheaded by a Panzer detachment, the first attack was made in the early hours of the morning of 3 February, but failed to smash through. Meanwhile, on the northern side of the road, 1st Grenadier battalion attacked and destroyed the Russian forces opposing them in hand to hand combat and drew the attention of the Red commanders to that sensitive area. That gave the chance for the “Hetzers” of the tank destroyer unit and the last of Hudel’s Panzers to carry out a second, and this time successful, thrust up the road. By 14.00hrs the Soviet ring had been ruptured and the westward withdrawal began. It was a shortlived move. At Kunersdorf more Soviet tanks had cut the road but, once again, the Panzer/SP group struck and destroyed them. During that battle Sergeant Riedmuller won the Knights Cross for destroying four T34s with successive shots and when the lie of the land prevented him from destroying the fifth, climbed out of his Panzer and “killed” it with a Panzerfaust. A stream of military and civilian vehicles was now pouring through the broken ring and 2nd Battalion gave flank protection to the main body of the battle group as it pulled back towards Frankfurt. The artillery units, positioned in the streets of Damm, a suburb of that city, fired barrages to cover the retreating formations. Some detachments of KG Langkeit were first held in Damm but were then ordered to cross to the Oder’s western bank and take up defensive positions there. The remainder of the battle group continued to hold the bridgehead. That eastern group fought bitterly to prevent the capture of Kunersdorf airfield which the Soviets needed as a forward base for the next stage of their offensive. In that fighting the bridgehead group suffered severe losses and even their most determined defence and skillfully mounted attacks could not prevent the Red Army from eventually crushing the Damm perimeter. 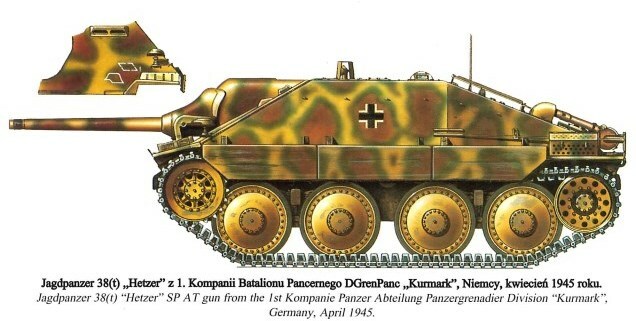 On 3 February, an order was issued upgrading Kampfgruppe Langkeit to “Kurmark” Panzergrenadier Division. It is at this place, therefore, that we leave the battle group and consider another one which fought in the east when the Third Reich was in its death throes. Grossdeutschland was sent to rescue the trapped units, but the front around them was crumbling. In response, the OKH was prompted to created some large Kampfgruppen to provide greater flexibility in defence. One of these new battle groups, Kampfgruppe Langkeit under the command of Oberst Willi Langkeit, was formed on 3 February 1945 and was made up from the Corps Panzergrenadier Replacement Brigade which was almost at full strength and Alarm Group Schmeltzer. It was organised as a Type 44 Panzergrenadier Division, with its Panzergrenadier battalions organised on the 1945 model, with three self-propelled gun companies equipped with Jagdpanzer 38s and one company with Pz IVs. The artillery battalion was organised from the 3rd Battalion, 184th (mot) Artillery Regiment. The Panzergrenadier regiment apparently had only a staff, a staff company, and two Panzergrenadier battalions. The order of 4 February 1945 gave the division an authorised strength of 4,559 men including 128 Hiwis. This entry was posted in Battle, Biography, German Units by MSW. Bookmark the permalink.